Happy Valentine’s Day! Five star restaurant or pjs and pizza? Whether or not we can agree on the perfect date, I think we can all agree that the homes below are perfection! 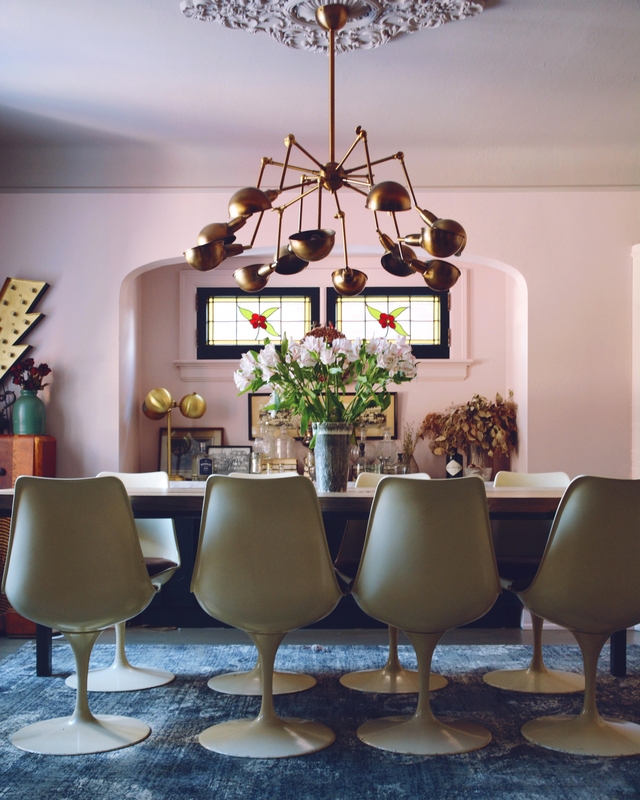 These ladies below know exactly how to use pink in their home. I have to admit I used to be scared to use pink in my own home but to be honest, I view it as a neutral now! If you don’t follow these ladies, go do it. I’ll wait here. Back? Great. Get ready to be inspired. I present to you, my galentines! 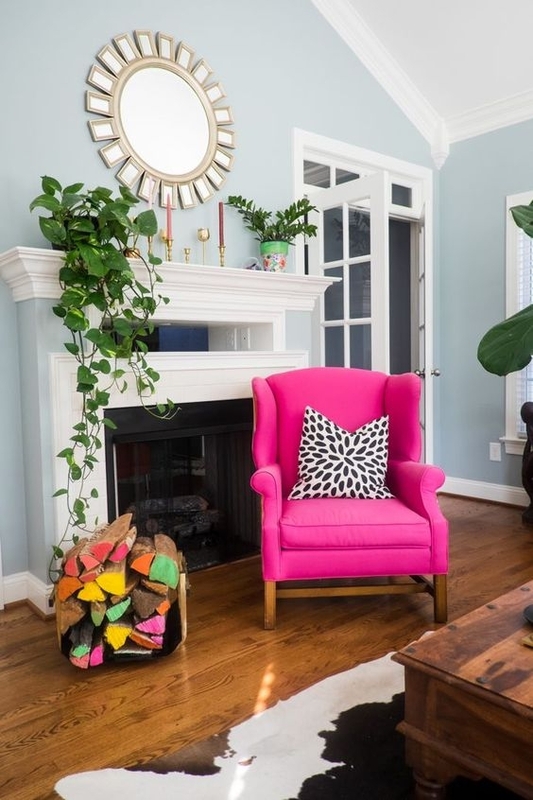 I have major fiddle leaf fig envy when it comes to Stacey‘s home and now I have pink chair envy as well. This gal has an eye for design. She thrifted this beauty of a chair and had it reupholstered in two different fabrics that she bought on sale at JoAnn’s. A woman after my own heart. I love anyone who can take a thrift find and make it look like a million bucks! I also love the little pop of pink she has with the candles on the mantle. The candles are accompanied by her Zgallerie mirror. Last but not least, let’s talk about those logs! So pretty! A simple DIY that makes the room pop! Stacey used chalk to color the ends of the logs. When I think pink, I think Tamara Lee! This woman is the queen of pink and she does it right! This is a shot of the infamous Frenchie! (that is the sofas much deserved name) This fun sofa is from Novogratz and it’s a really great find! How fun are her pillows? Her style truly reflects her personality. She’s super fun and so talented. Just in case you were wondering where you can find some of those cool prints on the wall, this lady has an Etsy shop too! Speaking of love, what is there not to love about Lisa Dawson‘s home? Her Instagram and blog is one I find myself going to daily to look for inspiration. Shes’s also another vintage lover! Lisa helps host the hashtag #myhomevibe– another great place to look for inspiration. If you want to get this wallpaper look, it’s from Cole&Son. 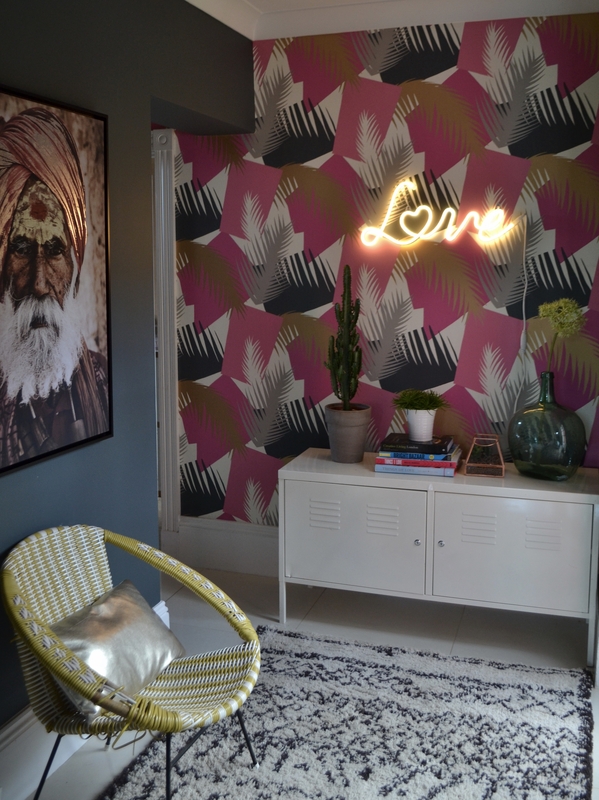 The neon light is from Homesense and was £40, which is about $50. I highly suggest going to check out her home on Instagram and her website! Ummmmm, where do we start here? LOVE LOVE LOVE Kim’s dining room. Kim is a Canadian Blogger with a fierce eye for design. 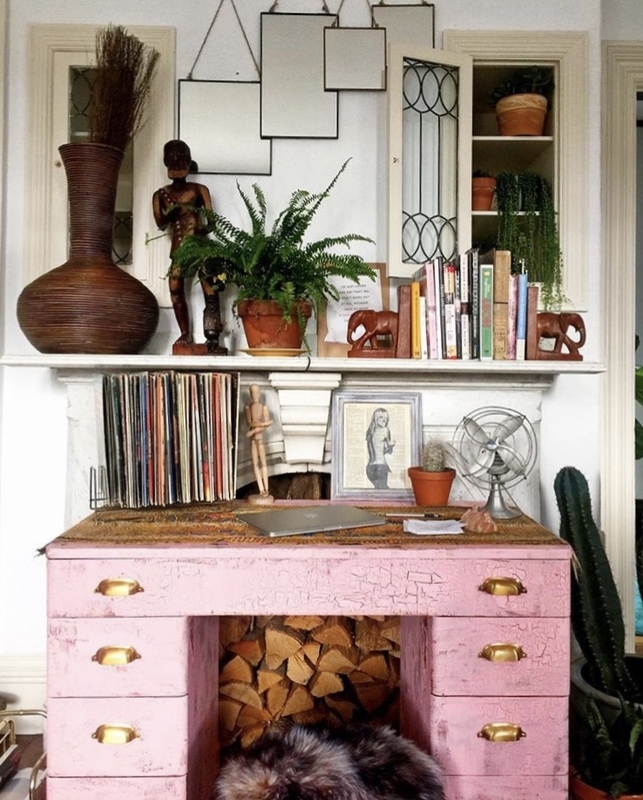 It’s rooms like this that make it obvious that pink isn’t just a “girly color”. If you have never wanted a pink wall in your home, I know you do now. If you’re as obsessed with this color as I am, the color is Calamine by Farrow & Ball. I also have to admit I’m a little (very) jealous of her tulip chairs and light fixture. She found both of them in Montreal. How amazing are they? This is my favorite part… not only was the radio in the corner converted into a bluetooth speaker by her hubby but he also built the table! He built it using hemlock that was dug up out of Queen’s Wharf in Canada and it was probably under water 200 years ago or so. How cool is that! Check his work out here daffdesign.com. Her style is so effortless and stunning. This girl right here is a boho goddess. I’ve had a crush on her desk ever since I first saw it. Her maximalist style is simply stunning. I feel like I could just look at her pics all day! The way the plants flow through her home is an art in itself. 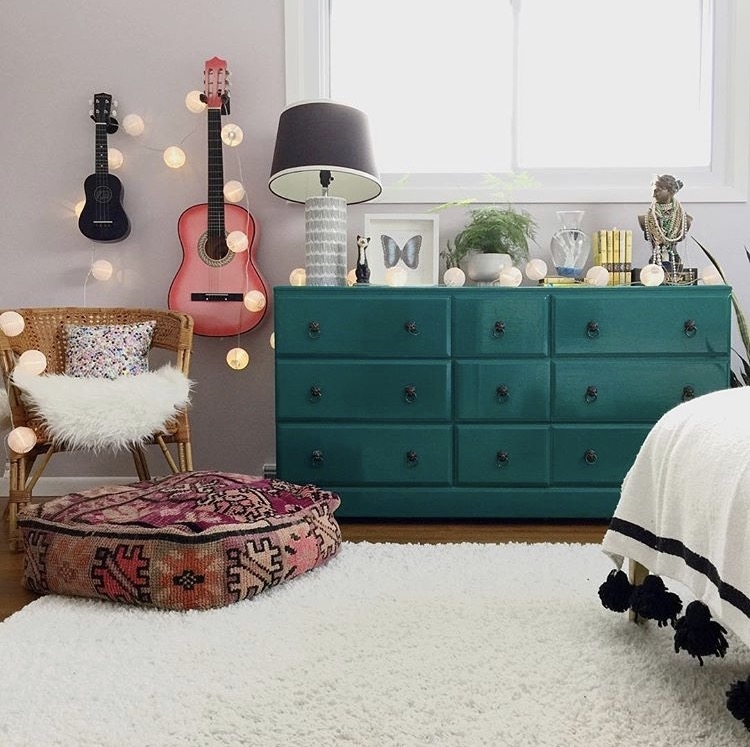 Kara is also a host for #moreismoredecor and #bohoismyjam, so you can definitely look those up on Instagram as well for inspo. Please go check out this gal’s gorgeous home! I feel like I am looking at a magazine when I’m scrolling through her Instagram! Emily is the queen of pink living! This photo is of her basement den in her Edinburgh home. How beautiful is this space? Not only is this space beautiful, it’s also multi-functional. This space is used for a sitting room, bar, cinema room, office and spare bedroom! Whoo! The sofa is actually a sofa bed. Talk about creative room design. Saving space AND keeping it beautiful. Get the look. 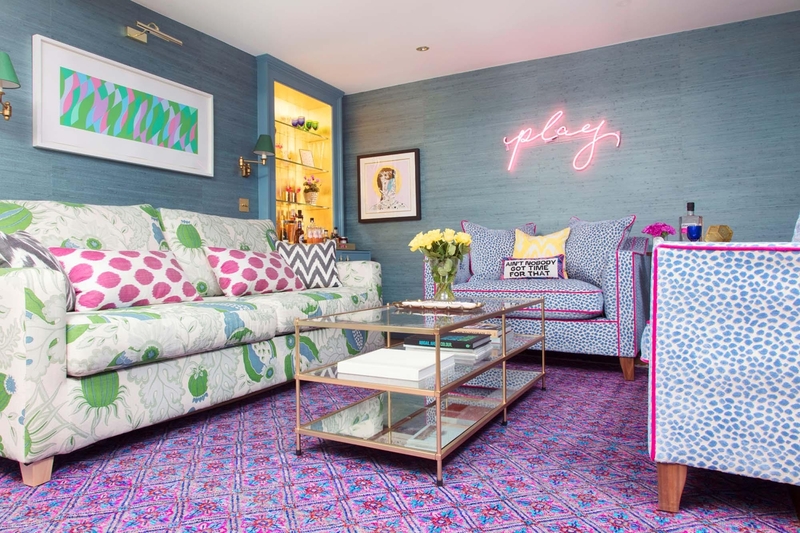 The rug is by Wendy Morrison Design, blue leopard print velvet chairs by Sofas & Stuff, sofa by John Lewis covered in Christopher Farr Carnival fabric, walls are Juicy Jute grasscloth by Phillip Jeffries, table by West Elm. 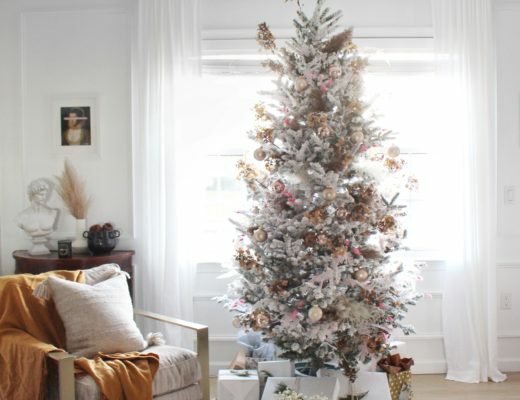 Head to Emily’s blog for more amazing design tips and sources. Eva is another boho goddess! Her home has so much personality! 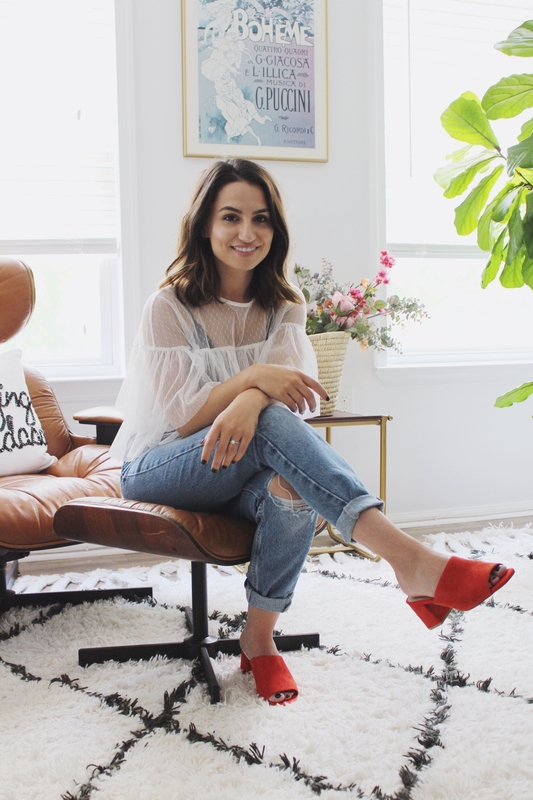 You’ll catch yourself looking at her home everyday for inspo! I also envy her plant mama skills. If you have a black thumb, I’m pretty sure she can show you her ways. Just in this one picture alone, look how much pattern and texture there is! She uses a pop of pink in the most perfect way. Eva is also a host of #bohoismyjam for obvious reasons. 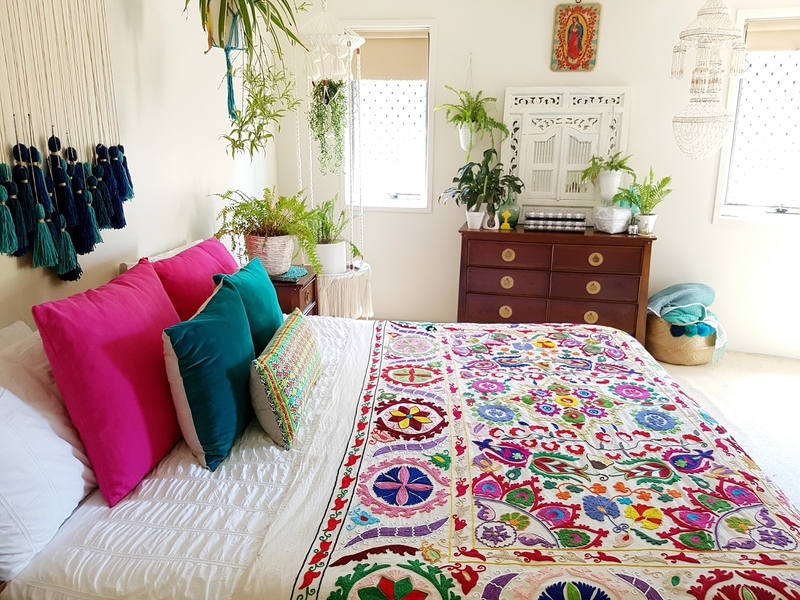 This rooms features items from Fat Rabbit Tapestry (wall hanging), Spotlight Stores (pink pillows), and La Boheme (blanket). Go check out Eva’s home and prepare yourself for some major beauty! This chick right here is one of my favs!! Jen has the best style and she’s so fun! Her home truly does resemble her fun vibrant personality. I mean come on’, let’s start with the high ceilings and pops of color. This room has so much depth and texture. Believe it or not, Jen found this cute little banner at Walgreens! This just proves what a fun gal she is (and how devoted she is to creating a beautiful home). She goes to Walgreens for Altoids and leaves with decor. I mean come on’ that’s my type of girl!! I’m pretty sure she also found that lamp and made it look like a million bucks! You really have to go follow her on Instagram because you’re sure to have fun and be inspired. Nichol!! One of my favorite Insta friends! Her home is stunning and really represents her sweet personality. Speaking of sweet, how about Liberty a.k.a the guardian of the pink door? I honestly feel like she is part of the decor. She is one beautiful pup! Nichol has an eye for effortless real living. Her pink front door should be the face of all pink doors. This color is called Radiant Pink by Valspar. The wall colors are also Valspar– Ocean Storm. Some other areas you should go check out in Nichol’s home are her dining room, bedroom, back yard…. okay just go check it all out because it’s ALL beautiful! She is definitely a must follow. Can Megan‘s home be any more perfect? I swear, I think every inch of her home is incredible. Megan has a unique style and she does it effortlessly. These little guitars on the wall get me every time, they are adorable. Her home has such a beautiful array of textures and patterns including this pouf by Zine Interiors. You can check them out on Instagram! I love how she drapes the lights in her home in such a playful relaxed way. It proves that decor does NOT have to be perfect– but rather perfectly imperfect. The lights are from Lights.com. Her personality resembles her home and it is fun! She is super refreshing to follow on Instagram. Go check her out! How fabulous is Lizbeth‘s home? She has the perfect amount of glam! The pops of pink in her home are so effortless and subtle that she makes pink look like a necessary neutral! 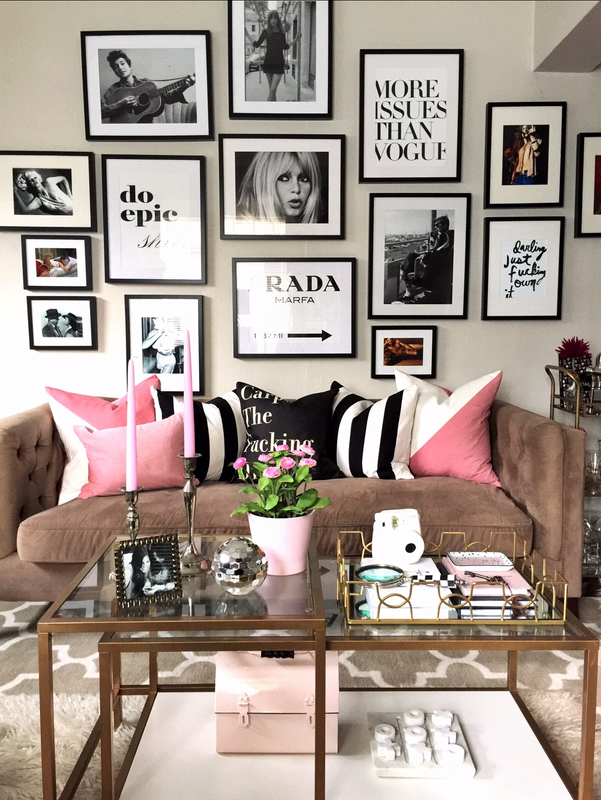 How amazing is this gallery wall? Every inch of Lizbeth’s home is stunning, even the kitchen. I mean this gal really knows how to make a home look beautiful! The gallery wall is a mix of Etsy finds. The wall includes her favorite fun quotes, movie stills, favorite artists, and models. This gallery wall really represents Liz’s fun personality. You can find this sofa at World Market and the coffee table at IKEA. 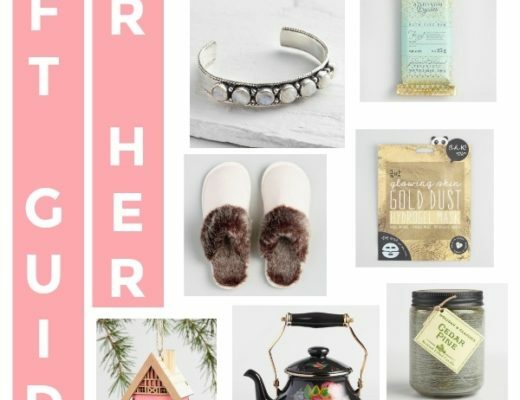 You can also shop Lizbeth’s own personal Etsy right HERE. 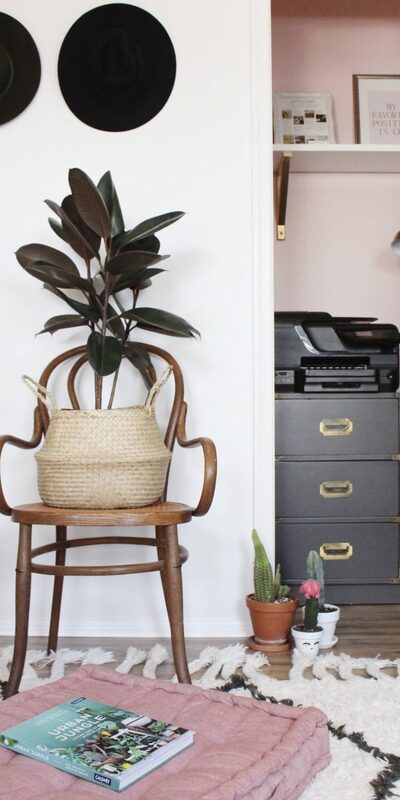 Janine chose the perfect name for her blog, Happy Happy Nester because there’s absolutely no way to be less than happy when looking at her home. I love how she incorporates the flowers and tons of texture through her pillows and blanket! I just love that chunky knit throw, so cozy! Get ready to be mind blown… those flowers are made from paper. Yes, paper! See her tutorial, here. 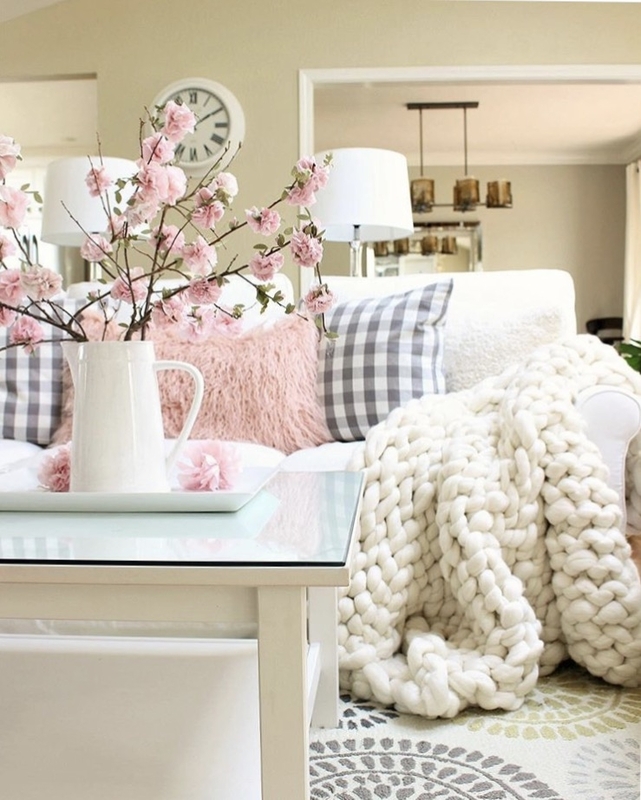 The pops of pink in her home are subtle and sweet it makes me wish it was Spring! Go check out Janine on Instagram for some major inspo! This is when I got really bold with pink in our home. 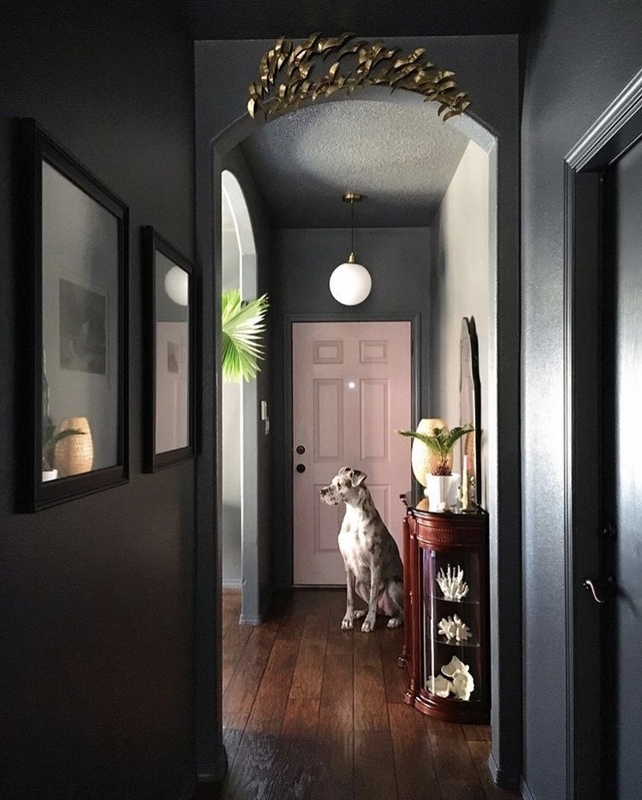 I’ve always had little touches of pink here and there with pillows and such but it got real when I painted the front door! 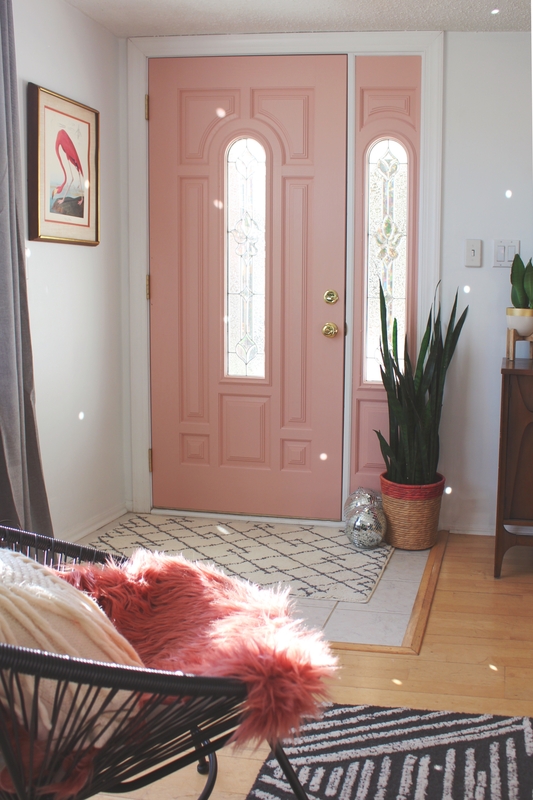 The color of the front door is called Rose Quartz by Behr. Small rug is from Target. If you’re staying in our guest room, I hope you like pink. 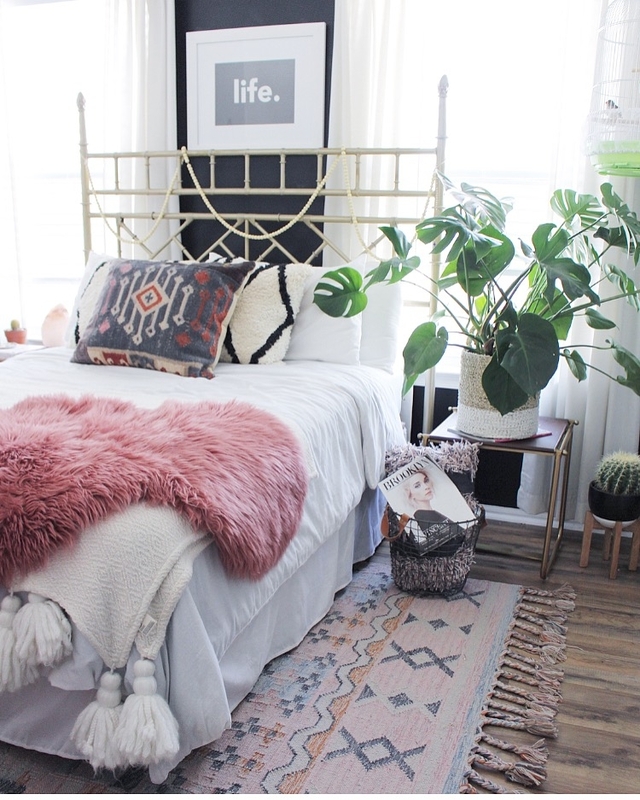 In this room we have my favorite rug from World Market (which is currently on sale) and our pink faux fur from Home Goods. The Turkish Pillow on the bed is also from Home Goods. I hope you enjoyed these wonderful homes! 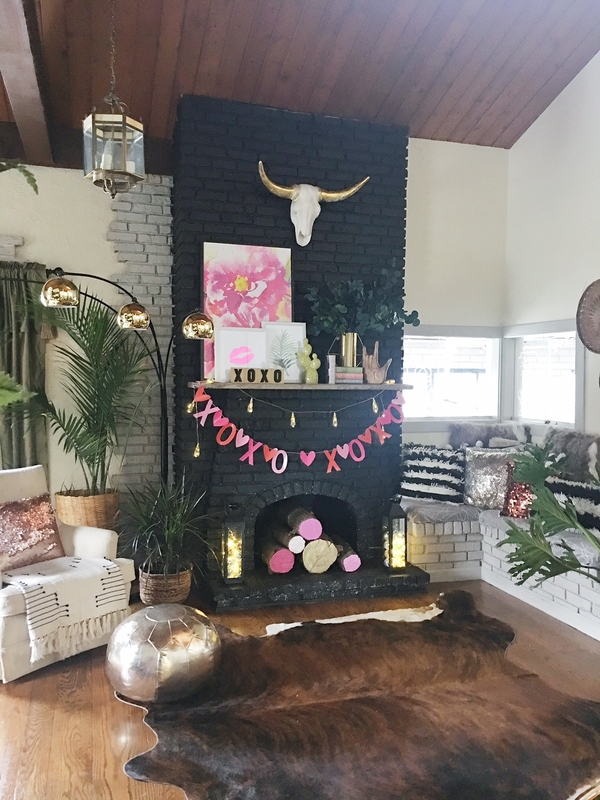 Tag me in all of your pink decor on Instagram! Creative, clean, fun and inspiring. You are so sweet and have such talent! What a fabulous list babe!!! What a great gathering of beautiful homes! Thank you so much for including me among such talented women, yourself included! You are so welcome, Janine! Thank you for being a part of it! awesome post Cara! you know I love me some pink so I was obvi soooooo excited to be included!!! thank you girl! Yes, girl! You are the queen of pink! Thanks so much for being a part of it.